Student satisfaction with the learning environment is one of the biggest challenges faced in the current dental education scenario. Integration of science with clinical practice is a key factor in any medical or dental curriculum, and acquisition of dental skills based on good theoretical knowledge is a basic need for any dental student. Clinical learning/skills taught in the 3rd and final years of Bachelor of Dental Surgery require integration of practical knowledge, skill, and attitude. Hence, dental students have added responsibility of acquiring training in clinical examination, dental procedures, hospital practices, and theoretical knowledge. However, in the current scenario, students often concentrate on clearing the dental courses by theory memorization, which results in lack of clinical skills to treat patients. Most of the dental school students have preference for different learning modes, but teaching by majority of dental educators is in a single mode: the lecture which inadvertently is a passive learning method that encourages memorization of subject and note-taking as the means of assimilating knowledge. Hence, to make learning process in dentistry to be more effective, it is important for dental educators to recognize that students have different learning modes, to reflect on the effectiveness of their methods of instruction, and to consider accommodating other learning preference modalities. For this purpose, various strategies are being introduced and practiced in dental schools with the purpose of facilitating students to become better dentists. One of them is to identify the learning preferences of students. Fleming and Baume, described four sensory modalities – visual, auditory, reading/writing, and kinesthetic (VARK). The learning style of students may be unimodal or multimodal depending on the use of single mode or multiple modes of learning, respectively. Learning preference can be defined as the most effective and efficient modality or manner in which a learner has a natural preference to perceive, process, store, and recall new information. The study by Jessee et al. underlined the value of understanding and acknowledging different student personality types and learning preferences as a way to initiate improvement of undergraduate dental education, promote student motivation, and allow for an expression of learning style preference. Many studies have been done to understand the learning preferences of medical students, and most of them are studies on nonclinical students or cross-sectional studies. However, there is a paucity of literature on the learning preferences of dental students. Hence, this study was designed to provide information about it. The objective of the present study was to know the learning preferences of the clinical dental students. This multicentric study included 350 students from four dental colleges in South India, with an undergraduate dental course of 5 years. The colleges selected were two private management institutes and two public institutes. The selection of institutes was from a total of 350 dental colleges of India. The four institutes were too small for a representative sample of all dental colleges of the country, but it was decided to select four due to the feasibility of the study. The institutes selected were some of the best in the country. Participants in this study consisted of students of the 3rd and final years who had completed their basic sciences and were presently pursuing their clinical courses. The student population covered included both upper and lower socioeconomic criteria as well as merit and reservation students. The study was approved by the Institutional Review Board. VARK inventory was used to sample sensory preferences of learning. VARK questionnaire version 7.1 was used and it consisted of 16 multiple-choice questions. It was downloaded from the VARK available from http://www.vark-learn.com/english/. Consent for download and the use for project was taken from the developer of VARK. The VARK survey instrument was used in this study because it is precise and quick to complete, and it provides necessary information for the student about their learning preferences. The survey was comprised 16 multiple-choice questions with four answer selections corresponding to the four sensory modalities. Various modal preferences were defined as monomodal (having one of the V, A, R, or K preferences), multimodal (having more than one preference) which is again divided into bimodal having two preferences, trimodal having three preferences, and quadrimodal having all the four preferences. Students were briefed about the VARK questionnaire by one of the coauthors. The questionnaire was then distributed among students in the hard copy format, and they were asked to submit their response to the VARK questionnaire at the end of their class. The questionnaires were scored and tabulated to determine the distribution of VARK preferences. Preference rankings were calculated by totaling all A responses (visual), all B responses (aural), all C responses (read/write), and all D responses (kinesthetic). Each category was equally weighted, and dominant preference was defined by determining which category received the most responses. The data were then entered in a Microsoft Excel sheet. Strong preference was calculated using the VARK guidelines, which is available from the site with URL: http://www.ntlf.com/html/lib/. The study sample consists of 350 students from different ethnic backgrounds. There were 212 female students and 138 male students and their age range from 19 years to 22 years. [Figure 1] shows 217 students having multimodal learning preferences (62%) and 133 students having monomodal learning preferences (38%). 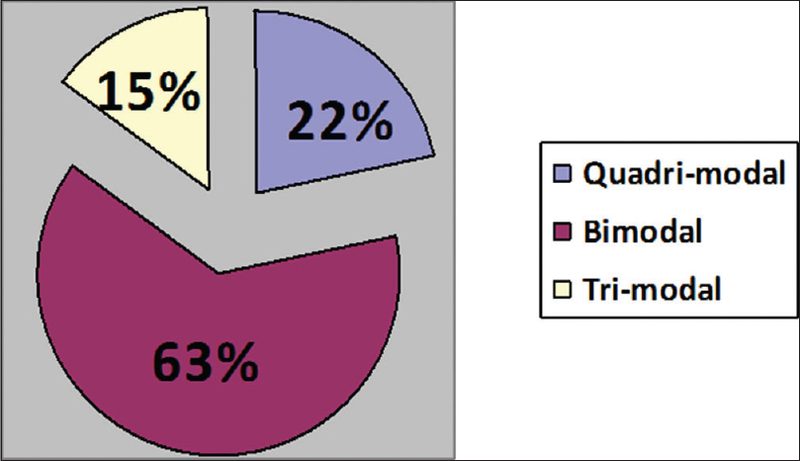 Multimodal [Figure 2] was consisted of 136 students showing bimodal preferences (63%), 47 students had quadrimodal preferences (22%), while 34 showed trimodal preferences (15%). 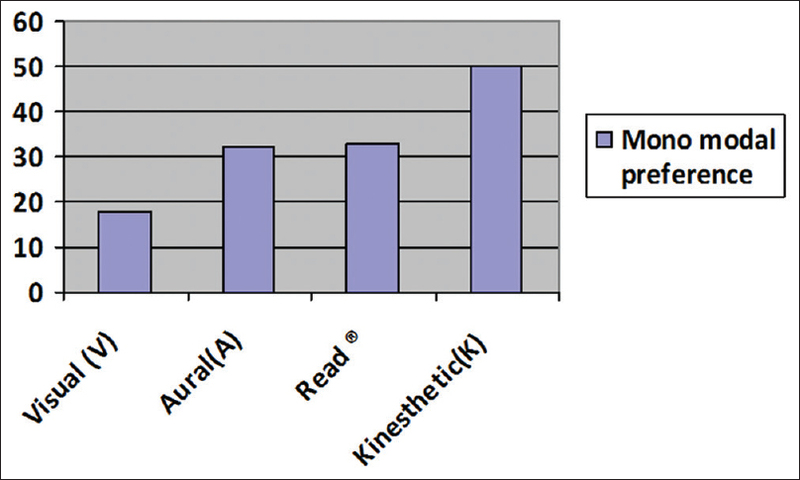 In the monomodal category comprising 133 students [Figure 3], all the four preferences were represented and kinesthetic modality was selected maximum by students. The present study was done to know the learning preferences of the clinical dental students. The study was performed in a multicentric environment involving 350 students from four dental colleges in India, with an undergraduate dental course of 5 years as stipulated by the governing body. To include students from all strata of society, the institutes selected were two privately managed institute and two public institutes. The private institute students were mostly from the upper socioeconomic section with parents holding high educational and economic backgrounds. The students also had access to better schools and learning environment which was not so for most students from the public institutes. The four institutes selected were not enough to form a representative sample of the approximately 350 colleges in India, due to the feasibility of conducting the research. However, four institutes were selected from South India. The institutes selected were some of the best in the country. Participants in this study consisted of students of the 3rd and final years who had completed their basic sciences and were presently pursuing their clinical courses. The student population covered included both upper and lower socioeconomic criteria as well as merit and reservation students. The merit students were academically higher caliber whereas the reservation students were selected through affirmative action and had a mix of academic and social backgrounds. The present study showed that majority of the students were multimodal (62%) in their learning preferences whereas bimodal category was the highest, followed by quadrimodal and trimodal categories were the least. Kinesthetic preference was the strongest in both monomodal and multimodal categories. Different learning preferences of students have been studied to understand their style of learning. Murphy et al. in 2004 in their study showed that 56% of dental students were multimodal. However, the single dominant preference is visual. Similarly, one of the main points of student frustration with the curriculum is the disparity between learning and the delivery of instruction. Nowadays, dental students have a preference for several learning styles, yet dental faculty members teach overwhelmingly in a single mode: the lecture. Nuzhat et al. showed that 72.6% of preclinical medical students in Saudi Arabia had multimodal learning preferences. The same study showed the aural group as the largest in monomodal category. Most of the studies done so far show similar results that majority of students have multimodal learning preferences. In dental schools, kinesthetic learning is usually achieved through preclinical laboratory classes or clinical instruction. Fleming and Baume, state that the goal of instruments such as VARK is to be a catalyst for dialog between students and educators. The instruments are quick and easy for students to use and understand, and ensuing discussions about survey results may help create a sense of self-awareness for the student as to how he or she learns best and a motivation to seek out the best methods to improve learning performance. Suskie urges students and educators to be wary of the predictive ability of learning style inventory measurements and cautions that while sensory preferences are useful as a launching point for inquiry, they should not be used as the sole source of information for creating learning improvement. There is still a debate whether matching the teaching methods to a preference or style improves learning process. Few academicians have suggested that the strongly preferred mode may not always be the best way to learn, depending on the specific situation. Therefore, students should try to adapt to learning modalities differing from their preferences because of real-life environmental constraints. The need to learn under different conditions will raise the students' self-confidence to face the world. Students can develop different strategies to study more efficiently once they know about their learning preference. Students can select their preferences and modify their usual study methods to understand the subject more effectively. Visual learners prefer the use of diagrams and symbolic devices such as graphs, flowcharts, hierarchies, models, and arrows that represent printed information. They may also explain a concept to others by drawing a diagram or picture. Aural learners concentrate on what lecturers say. They would prefer to listen rather than take notes. After lecture, they may choose to discuss presented topics with classmates as a means to clarify their understanding. To aid their studying, aural learners may talk out their answers or listen to taped discussions about examination topics. Read/write learners prefer printed words and text as a means of information intake. They prefer lists, glossaries, textbooks, lecture notes, or handouts. These learners prefer to arrange lecture notes into outlines, paraphrase classroom notes, and study old multiple-choice examinations. Kinesthetic preference refers to learning achieved through the use of experience and practice. In other words, the kinesthetic learner has to feel or live the experience in order to learn it. As we have seen through our study, each student is different in his or her learning habit. 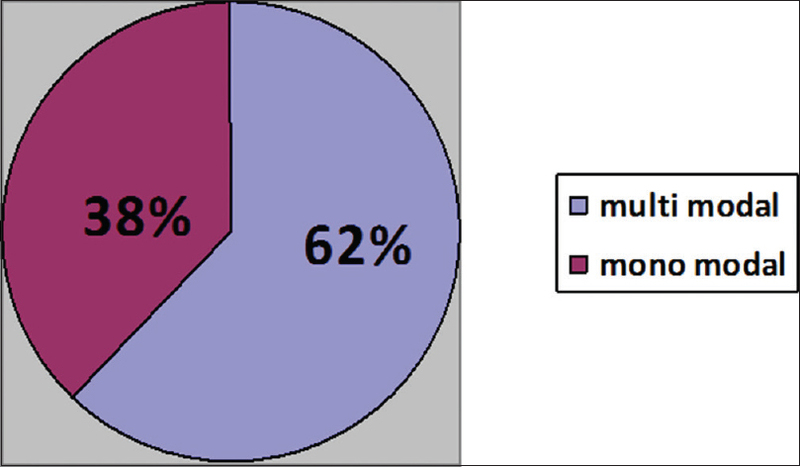 Few are monomodal and majority of them are multimodal. This information necessitates a change in learning style. Teachers can improve their teaching style from monotonous boring lecture classes to the more interactive with better visual aids to make the subject more interesting and understandable. Majority of the clinical dental students irrespective of their academic and social background are multimodal in their learning preference, and kinesthetic modality is their strongest single preference. Murphy RJ, Gray SA, Straja SR, Bogert MC. Student learning preferences and teaching implications. J Dent Educ 2004;68:859-66. Sinha NK, Bhardwaj A, Singh S, Abas AL. Learning prefernces of clinical students. A study in a Malaysian medical college. Int J Med Public Health 2013;3:60-3. McCann AL, Schneiderman ED, Hinton RJ. E-teaching and learning preferences of dental and dental hygiene students. J Dent Educ 2010;74:65-78. Fleming N, Baume D. Learning Style Again VARK up the Right Tree. Available from: http://www.vark-learn.com/documents/educational%20 developments.pdf. [Last accessed on 2012 Apr 20]. Fleming N. VARK: A Guide to Learning Styles. Available from: http://www.vark-learn.com/english/index.asp [Last accessed on 2012 Apr 16]. Jessee SA, O'Neill PN, Dosch RO. Matching student personality types and learning preferences to teaching methodologies. J Dent Educ 2006;70:644-51. Nuzhat A, Salem RO, Quadri MS, Al-Hamdan N. Learning style preferences of medical students: A single-institute experience from Saudi Arabia. Int J Med Educ 2011;2:70-3. Suskie L. What are Learning Styles? Can We Identify Them? What is Their Place in an Assessment Program?First year Assessment Listserv. Available from: http://www.brevard.edu/fyc/listserv/remarks/suskie2.htm. [Last accessed on 2003 Feb 27]. Parolia A, Mohan M, Kundabala M, Shenoy R. Indian dental students' preferences regarding lecture courses. J Dent Educ 2012;76:366-71.